180312- Impact Areas — Terra Cura Inc.
Our food system is a key lever that bonds three big divides - our relationship with nature, others, and most importantly, the relationship within. Inevitably, many projects has a focus on agriculture - addressing soil regeneration, sustainable growing practices, and food access. We embrace principles and strategies of the Permaculture movement, promoting the ethics of land care, people care, and fair share. Every project begins with uncovering the potential of a place. Each design holds a unique body of complex, inter-dependent relationships. We incorporate authentic story-telling as a powerful tool to inspire will. By capturing the spirit and process in a lively manner, each story serves as an open resource for civic education. 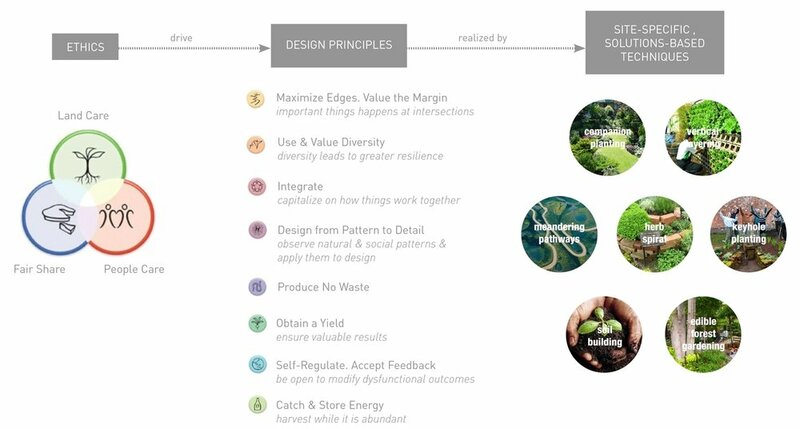 Designers and community developers can also learn about the potential of the emerging discipline of regenerative development. See sample story for an urban food forest project. A collaboration between Terra Cura, Somerville Media Center, independent artist Stuart Roelke, funded by City of Somerville Community Preservation Act grant, this is an educational video outlining our regenerative development process for the redesign of Somerville Community Growing Center, a 1/4 acre urban oasis near Union Square, Somerville Massachusetts, created 20 years ago for environmental education, community gatherings, and cultural performances. We believe change at the community level starts with reforming oneself. It is a reflective practice that elevates our consciousness -- the way we care for ourselves and others. To build individual and collective will, community engagement and organizational development are integrated into each project's design process. It cultivates the potential and skills needed to effectively implement a project, as well as the ability for projects and stakeholders to sustain motivation thereafter. We believe it is essential to pursue at least three lines of work together and simultaneously. This framework enables Terra Cura to align personal and professional development with our values and design process. It assists in holding the big picture in mind - nested, inter-dependent areas of impact that we aspire to set in motion for each client.